Hanoi (VNA) – The Ministry of Natural Resources and Environment (MoNRE), together with relevant ministries and agencies, is accelerating the building of a master plan for the Mekong Delta’s sustainable development in adaption to climate change to 2030 with a vision to 2050. The master plan will serve as the foundation for designing and implementing long-term specific tasks in line with the Government’s Resolution 120 on sustainable development of the Delta in the context of climate change. At the same time, the MoNRE and partners are also working on an inter-sectoral database and an integrated database for the Mekong Delta. The work is conducted as part of preparation for the second conference of the Government on the Mekong Delta’s sustainable development slated for May 12 to 17. The Mekong Delta accounts for 12 percent of the national natural acreage and 19 percent of the national population. 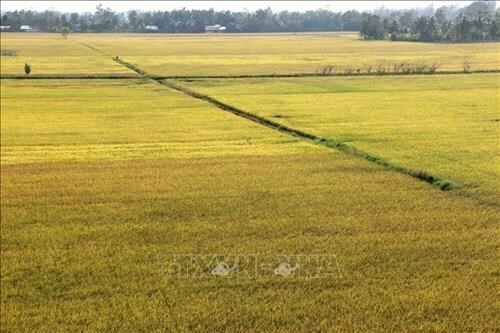 It is the country’s biggest agricultural hub, contributing 50 percent of the national rice output, 65 percent of aqua-cultural output, and 70 percent of fruit output. However, due to its location in low and unstable land, the region is highly vulnerable to impacts of climate change. Sea level rise and depression are posing serious threats to the region’s sustainable development, requiring a new vision, strategic orientation and synchronous and comprehensive solutions. For those reasons, in late 2017 the Government issued Resolution 120 with a vision to 2100 of sustainable, safe and prosperous development of the Mekong Delta on the foundation of high-quality agriculture in combination with services, ecological tourism, and industry, especially processing industry, which will help to increase the value and competitiveness of local agricultural products. The infrastructure system of the delta will be carefully planned and developed in a synchronous, smart and climate-change adaptive manner. The resolution set the goal that by 2050, the Mekong Delta will become a region of upper-level development with income per capita higher than the national average while the proportion of ecological agriculture and high-quality applied agriculture will reach 80 percent of agriculture. After more than one year implementing the resolution, around 18 trillion VND (780 million USD) has been allocated to programmes, projects and tasks. The sum included 4.75 trillion VND sourced by the central budget for the national target programme on responding to climate change and promoting green growth, and 1.5 trillion VND from the central budget’s reserve for areas threatened by serious erosion. A report of the MoNRE’s Department for Climate Change showed ministries and agencies had issued a number of breakthrough mechanisms and policies in implementing Resolution 120, such as those for land concentration serving large-scale production, management of water and mineral resources, incentives for investment in agriculture and rural development, and development of support industries for agriculture and farm produce processing. At the local level, localities in the Mekong Delta have built brackish-water shrimp farming models, and developed salinity-resistant rice varieties and drought-resistant fruit tree varieties. Many models of sustainable agricultural production have been formed, and the use of modern machinery in processing has been promoted. A number of regional-level projects have been developed and implemented, such as the Mekong Delta Integrated Climate Resilience and Sustainable Livelihoods Project involving all nine provinces in the region, the Cai Lon-Cai Be irrigation project, and the Tra Su-Tri Ton reservoir for flood storage and fresh water supply in the Long Xuyen Quadrangle. In particular, Vietnam has conducted cooperative projects in the Mekong Delta with several development partners, including the Netherlands. While Resolution 120 marked a breakthrough in the way of thinking, some agencies and Mekong Delta localities have been slow in catching up with the new approach based on internal resources, thus failing to engage organisations, businesses and the people in efforts for local sustainable development. The building of institutions and policies serving the implementation of tasks set by Resolution 120 is also slow, while the planning work under the resolution has encountered legal problems under the new Planning Law.